The government’s move to strengthen the Overseas Investment Act on Monday was met with predictable criticism from the â€˜markets first, people second’ brigade. National Deputy Leader Bill â€˜Privatise â€˜em all’ English came out quickly on the side of big foreign money against New Zealand control of vital assets. But Bill’s supposed leader, John Key, didn’t know what he should think. Should he go with what most people want or should he give a nod to National’s big business base? It’s tough when you don’t have your own principles to draw upon; constantly having to be whatever your current audience wants you to be. And this time Key had two conflicting audiences at once: ordinary kiwis and the business elite. The result was a flustered Key who didn’t know what to say in Parliament and to the media yesterday. No doubt when Key does eventually make up his mind, he will be both for protecting our assets and against it, depending on whom he’s talking to. UPDATE: TV3 has footage of Key being very slippery to the media about his position. Check out Bill English in the background, clearly in pain watching Key’s contortions. OMG John Key Slippery who would have thought? The captcha is Key Antonio??? If laboru were so concerned about protecting these so-called “vital assets” why did they wait until the end of the sale process? Was it only to cause maximum grief and cost to the shareholders, compnay and potential purchasers? I can spell, I just can’t type. The whole Auckland airport thing is stupid. Billy. It’s hardly the end of the process, and anyway, is that the best National can come up with? ‘we wouldn’t have done it but Labour did it too late?’ Can’t have it both ways. Perhaps if business was a bit more open about it’s intentions ahead of time this could have been done “better”. What I don’t get is 75% of the shares are held privately, and as private shareholders they are free to sell their shares to whomever they want, NZ resident or not. So why has there been no concern about the shares being sold piecemeal to a range of overseas shareholders? We had a Dubai company bidding last year. So this is not about foreign investment per se, it is about the sale to a single purchaser. What if the purchaser was infratil and then infratil got sold? Would there be as many problems? Steve, you are confused. I do not speak for the National Party. They do not speak for me. ‘sod. Where’s the love? You’re all angry little man, lately. So it never occurred to those brave protectors of our essential strategic assets that the Dubai Aerospace bid might have resulted in a sale? That fell over in August. In that case, add being thick to all of their other crimes. The airport is privately owned. Why would the board have to bemore open about intentions? What could be more open than publicly announcing them? Knee jerk reaction by a desperate party looking for a distraction from the bungle and corruption at the HBDHB. The reality is that this announcement has written $300m off the value of the share valaue of the Auckland Airport. A popularist move that will lead to unintended consequences – including sending a very bad message to the markets that we have a government who will interfere in private ownership issues. John Key was right to step back and analyse the situation and basically say – the rules would not have bneen changed (and I doubt they would have been changed if Labour was not 20 points behind in the polls. “And basically say” Monty? I don’t think he *basically said* anything he was so busy writhing around his own words. Why can’t John Key just give a straight answer? You hyperbolic little fools – for a bunch of folk who predicate your philosophy on “rational man” you are very prone to bout of hysteria. Have a cup of tea and a lie down before you next comment, eh? Billy. I know you don’t speak for the Nats you’re just repeating their lines. Insider. The issue is foreign control, not foreigners having some ownership. Which is a pretty strong case against the xenophobia argument put up by the Herald editorial. Hang on, but isn’t Auckland Airport already a privately owned publically listed company? If this was the thinking of the Government, why has it let the process go on for so long? Isn’t the Government the majority Shareholder of the Auckland Airport’s biggest customer? Isn’t that a conflict of interest? 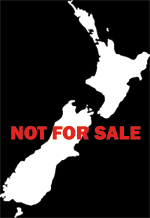 What about the NZ investors who have had the value of their share substantially eroded by this governments actions? Given that this isuue was never about foreign control, only about foreign investment, and also given that a major company, Infratil, has shares in a number of airports overseas, and that some 40% of Auckland Airport shares are already in foreign hands, what was the point of all this? slighty. It is about foreign control. Currently 40% of the airport is owned overseas but not as a block, those foreign shareholders exert no real control over the company. A 40% block owned by the CPF would be effectively controlling, it would dwarf all other sharehodlers and only need 10.1% more support to do whatever it wants. captcha: tory Heavan – is where foreigners own everything? I think you’re all missing one important unintended bad consequence of this decision – it sends a clear message to the current board of directors that they can do a rubbish job and avoid the risk of a sharper crowd taking over. That, quite simply, is the single biggest motivating factor of Board of Directors and Management – do a good job, keep the share price consistent with underlying asset value, and no-one swoops in and takes your job when they see a bargain. “We have always been clear that our desire is to hold a minority stake in the airport, not a controlling one,’ he said. Phil you are dead right. I am wondering, is AIA a good buy or not. The govt intervention potentially removes a discipline on the management of the company. It may even result in degradation of the asset as they may decide to not invest because they don’t need to compete anymore as they are the anointed airport. Or as a “strategic asset” they may feel untouchable and pursue a range of vanity projects that cost more than they are worth – see the history of many of the SOEs. If it’s about foreign control, what’s to stop a couple of companies buying up less than 40% each but having a joint approach to managing their interests, eg Ameritech and Bell Atlantic with Telecom? Travellerev, great read hope you don’t mind me link whoring this from your blog.